Adequate Steel has been offering a comprehensive range of racking solutions to fit both industrial as well as retailing needs. High quality raw materials, timely delivery, ease of installation, prominent display, excellent finishes, customized shelving, cost effectiveness, etc., are some of the stand out advantages that clients have with Adequate Steel which has made it one of the most renowned names in the industry offering supermarket racks, fruit and vegetable racks, electronic racks, showcase racks, pharmacy racks, textile racks, book racks, shoe racks, accessory racks, etc. Among racking and shelving solutions offered to electronic showrooms and retail outlets, Adequate Steel yet again offers a wide range – electronics market display racks, appliances display racks, LCD display racks, T.V racks, Split AC racks, laptop display racks, front display counters, slat wall gondolas, podiums, CD/DVD display racks, perforated racks, Double stack racks, etc., to name a few. Though there are different shelving and racking systems being offered, perforated display racks are the most common racks that you will find in electronic showrooms. 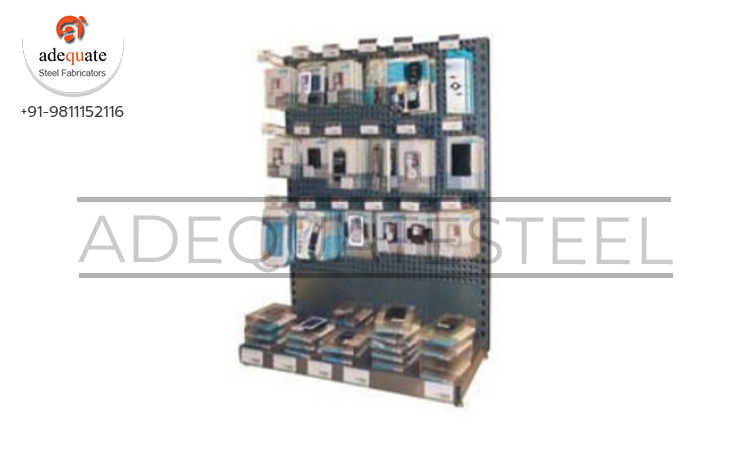 Adequate Steel offers pegboard display stands that are appealing while not compromising on the industrial standards. These racks are known for its latest technology and modular designs as it is made suited to most retail and merchandising outlets. The sturdy construction, dimensional accuracy and enhanced durability are some of the benefits that pegboard displays from Adequate Steel offer.